If you are one of those anglers that couldn’t be bothered with cooking next to the bank, then consider this dish on your next camping trip. 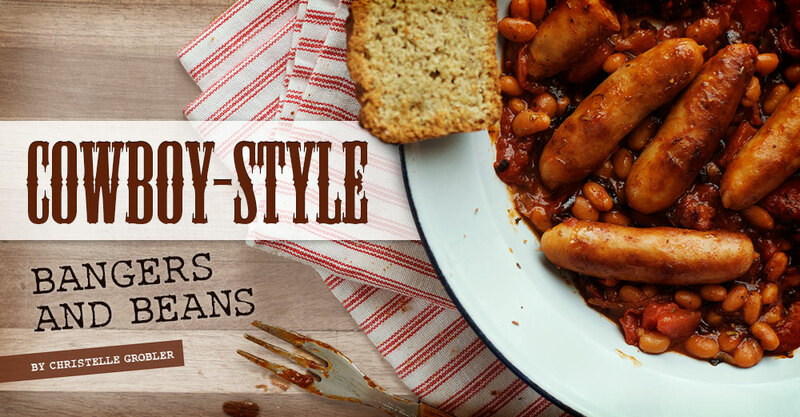 This bankside meal shouldn’t keep you occupied for too long, and the cowboy style bangers and beans dish is quick, easy and delicious to make. All you need is a Skottel Braai, or you can use a pan over a gas cooker. The canned ingredients make packing easier on those long camping trips with fewer goodies filling up your cooler box. The only ingredient that you need to keep frozen are the cocktail pork bangers, simply thaw them on the day you want to throw this fuss-free meal together. Enjoy this meal over buttery toast or a tasty bun. Heat the oil in the pan and fry the chopped onion until soft, add the diced bacon. Fry the bacon until slightly crisp and the onion starts to caramelise. Add the pork bangers, and fry for another 5 to 8 minutes. Add the baked beans, chopped tomatoes and the rest of the ingredients. Simmer for a few minutes, stirring occasionally, until the sauce has reduced slightly. Season with salt and pepper. Serve with your choice of bread.